by John E. Douglas & Mark Olshaker | Nonfiction | This book has not been rated. America's foremost expert on criminal profiling provides his uniquely gripping analysis of seven of the most notorious murder cases in the history of crime -- from the Whitechapel murders to JonBenet Ramsey -- often contradicting conventional wisdom and legal decisions. Jack the Ripper. Lizzie Borden. The Zodiac Killer. Certain homicide cases maintain an undeniable, almost mystical hold on the public imagination. They touch a nerve deep within us because of the personalities involved, their senseless depravity, the nagging doubts about whether justice was done, or because, in some instances, no suspect has ever been identified or caught. Was Jack the Ripper actually the Duke of Clarence, eldest grandson of Queen Victoria, or perhaps a practicing medical doctor? And did highly placed individuals within Scotland Yard have a good idea of the Ripper's identity, which they never revealed? Douglas and Olshaker create a detailed profile of the killer, and reveal their chief suspect. Was Lizzie Borden truly innocent of the murder of her father and stepmother as the Fall River, Massachusetts, jury decided, or was she the one who took the ax and delivered those infamous "whacks"? Through a minute-by-minute behavioral analysis of the crime, the authors come to a convincing conclusion. Did BrunoRichard Hauptmann single-handedly kidnap the baby son of Charles and Anne Morrow Lindbergh, the most famous couple in the world, or was he an innocent man caught up and ultimately executed in a relentless rush to judgment in the "crime of the century"? What kind of person could kill six-year-old JonBenet Ramsey on Christmas night in her own home? Douglas was called in on the case shortly after the horrifying murder, and his conclusions are hard-hitting and controversial. Why, in the face of the majority of public, media, and law enforcement opinion, including former FBI colleagues, does Douglas believe that John and Patricia Ramsey did not murder their daughter? And what is the forensic and behavioral evidence he brings to bear to make his claim? 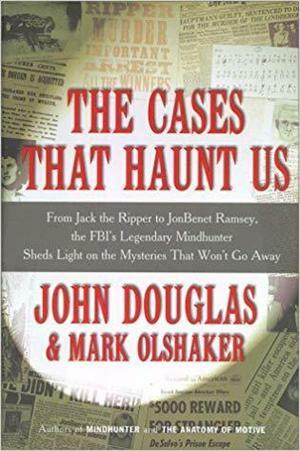 Taking a fresh and penetrating look at each case, the authors reexamine and reinterpret accepted facts and victimology using modern profiling and the techniques of criminal analysis developed by Douglas within the FBI. This book deconstructs the evidence and widely held beliefs surrounding each case and rebuilds them -- with fascinating and haunting results. No matter, as it is the thought that counts and I have another dear friend to pass this along to who doesn't already have it. The book that I promised to send to you forever ago. Received, thank you very much. Looks interesting!